"Woad" redirects here. For the American radio station, see WOAD (AM). For 'Woads' as a fictional name for a tribe, see Picts. Isatis tinctoria, also called woad (/ˈwoʊd/), dyer's woad, or glastum, is a flowering plant in the family Brassicaceae. It is occasionally known as Asp of Jerusalem. Woad is also the name of a blue dye produced from the leaves of the plant. Woad is native to the steppe and desert zones of the Caucasus, Central Asia to Eastern Siberia and Western Asia (per Hegi) but is now also found in South-Eastern and Central Europe and western North America. The Hunt of the Unicorn tapestry, dyed with weld (yellow), madder (red), and woad (blue). Since ancient times, woad was an important source of blue dye and was cultivated throughout Europe, especially in Western and Southern Europe. In medieval times there were important woad-growing regions in England, Germany and France. Towns such as Toulouse became prosperous from the woad trade. Woad was eventually replaced by the more colourfast Indigofera tinctoria and, in the early 20th century, both woad and Indigofera tinctoria were replaced by synthetic blue dyes. Woad has been used in traditional Chinese medicine for centuries. There has also been some revival of the use of woad for craft purposes. The first archaeological finds of woad seeds date to the Neolithic. The seeds have been found in the French cave of l'Audoste, Bouches-du-Rhône, France. Impressions of seeds of Färberwaid (Isatis tinctoria L.) or German indigo, of the plant family Brassicaceae, have been found on pottery in the Iron Age settlement of Heuneburg, Germany. Seed and pod fragments have also been found in Iron Age pit at Dragonby, North Lincolnshire, United Kingdom. The Hallstatt burials of the Hochdorf Chieftain's Grave and Hohmichele contained textiles dyed with woad dye. Melo and Rondão write that woad was known "as far back as the time of the ancient Egyptians, who used it to dye the cloth wrappings applied for the mummies." Skelton informs us that one of the early dyes discovered by the ancient Egyptians was "blue woad (Isatis tinctoria)." Lucas writes, "What has been assumed to have been Indian Indigo on ancient Egyptian fabrics may have been woad." Hall states that the ancient Egyptians created their blue dye "by using indigotin, otherwise known as woad." Celtic blue is a shade of blue, also known as glas celtig in Welsh, or gorm ceilteach in Scottish Gaelic. Julius Caesar reported (in Commentarii de Bello Gallico) that the Britanni used to colour their bodies blue with vitrum, a word that roughly translates to "glass", but has also been translated as "woad" (Isatis tinctoria). Carr suggests the translation of: "dye themselves with glazes" or "'infect themselves (or 'work into themselves') with glass'". The latter could refer to using glass in the tattooing process or to scarification. It has also been claimed that Caesar was referring to some form of copper- or iron-based pigment. Analysis done on the Lindow Man did return evidence of copper. The same study also noted that the earliest definite reference to the woad plant in the British Isles dates to a seed impression on an Anglo-Saxon pot. The authors theorized that vitrum could have actually referred to copper(II) sulfate's naturally occurring variant chalcanthite or to the mineral azurite. A later study concluded the amount was "not of sufficient magnitude to provide convincing evidence that the copper was deliberately applied as paint". In terms of usage, vitrum is more often used to refer to glass rather than woad. Woad was an important dyeing agent in much of Europe and parts of England during the medieval period. However, dye traders began to import indigo during the sixteenth and seventeenth centuries, which threatened to replace locally grown woad as the primary blue dye. The translation of vitrum as woad may date to this period. Due to this and other Roman accounts of them painting or tattooing their bodies, northern inhabitants of Britain came to be known as Picts (Picti), meaning "painted ones" in Latin. People with modern experiences with woad as a tattoo pigment have claimed that it does not work well, and is actually caustic and causes scarring when put into the skin. Gillian Carr conducted experiments using indigo pigment derived from woad mixed with different binders to make body paint. The resulting paints yielded colours from "grey-blue, through intense midnight blue, to black". See National Anthem of the Ancient Britons. No mader, welde, or wood no litestere. 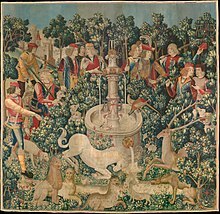 The three colours can be seen together in tapestries such as The Hunt of the Unicorn (1495–1505), though typically it is the dark blue of the woad that has lasted best. In Viking age levels at archaeological digs at York, a dye shop with remains of both woad and madder have been excavated and dated to the 10th century. In medieval times, centres of woad cultivation lay in Lincolnshire and Somerset in England, Jülich and the Erfurt area in Thuringia in Germany, Piedmont and Tuscany in Italy, and Gascogne, Normandy, the Somme Basin (from Amiens to Saint-Quentin), Brittany and, above all, Languedoc in France. This last region, in the triangle created by Toulouse, Albi, and Carcassonne, was for a long time the most productive of woad, or "pastel" as it was known there, one writer commenting that "woad... hath made that country the happiest and richest in Europe." 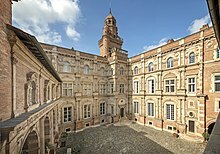 The prosperous woad merchants of Toulouse displayed their affluence in splendid mansions, many of which still stand, as Hôtel de Bernuy and Hôtel d'Assézat. One merchant, Jean de Bernuy, a Spanish Jew who had fled the inquisition, was credit-worthy enough to be the main guarantor of the ransomed King Francis I after his capture at the Battle of Pavia by Charles V of Spain. Much of the woad produced here was used for the cloth industry in southern France, but it was also exported via Bayonne, Narbonne and Bordeaux to Flanders, the Low Countries, Italy, and above all Britain and Spain. A major market for woad was at Görlitz in Silesia. The citizens of the five Thuringian Färberwaid (dye woad) towns of Erfurt, Gotha, Tennstedt, Arnstadt and Langensalza had their own charters. In Erfurt, the woad-traders gave the funds to found the University of Erfurt. Traditional fabric is still printed with woad in Thuringia, Saxony and Lusatia today: it is known as Blaudruck (literally, "blue print(ing)"). Medieval uses of the dye were not limited to textiles. For example, the illustrator of the Lindisfarne Gospels used a woad-based pigment for blue paint. The dye chemical extracted from woad is indigo, the same dye extracted from "true indigo", Indigofera tinctoria, but in a lower concentration. Following the Portuguese discovery of the sea route to India by the navigator Vasco da Gama in 1498, great amounts of indigo were imported from Asia. Laws were passed in some parts of Europe to protect the woad industry from the competition of the indigo trade. It was proclaimed that indigo caused yarns to rot: "In 1577 the German government officially prohibited the use of indigo, denouncing it as that pernicious, deceitful and corrosive substance, the Devil's dye." "... a recess of the Diet held in 1577 prohibited the use of 'the newly-invented, deceitful, eating and corrosive dye called the devil's dye.'" This prohibition was repeated in 1594 and again in 1603. In France, Henry IV, in an edict of 1609, forbade under pain of death the use of "the false and pernicious Indian drug". With the development of a chemical process to synthesize the pigment, both the woad and natural indigo industries collapsed in the first years of the 20th century. The last commercial harvest of woad until recent times occurred in 1932, in Lincolnshire, Britain. Small amounts of woad are now grown in the UK and France to supply craft dyers. The classic book about woad is The Woad Plant and its Dye by J. B. Hurry, Oxford University Press of 1930, which contains an extensive bibliography. A method for producing blue dye from woad is described in The History of Woad and the Medieval Woad Vat (1998) ISBN 0-9534133-0-6. Woad is biodegradable and safe in the environment. In Germany, there have been attempts to use it to protect wood against decay without applying dangerous chemicals. Production of woad is increasing in the UK for use in inks, particularly for inkjet printers, and dyes. The plant can cause problems, however: Isatis tinctoria is classified as an invasive species in parts of the United States. Indigowoad root (Chinese: 板藍根; pinyin: bǎn lán gēn) is a traditional Chinese medicine herb that comes from the roots of woad. Literature on traditional Chinese medicine uses the scientific name Isatis indigotica, although this name is usually considered synonymous with Isatis tinctoria by botanists. It is also known as Radix isatidis. The herb is cultivated in various regions of northern China, namely Hebei, Beijing, Heilongjiang, Henan, Jiangsu, and Gansu. The roots are harvested during the autumn and dried. The dried root is processed into granules, which are most commonly consumed dissolved in hot water or tea. The product is very popular throughout China. Possible minor side effects include allergic reactions and dizziness; only large dosages or long term usage can be toxic to the kidneys. Treatments have not generally been evaluated clinically. In certain locations, the plant is classified as a non-native and invasive weed. It is listed as a noxious weed by the agriculture departments of several states in the western United States: Arizona, California, Colorado, Idaho, Montana, Nevada, New Mexico, Oregon, Utah, Washington, and Wyoming. In Montana, it has been the target of an extensive, and largely successful, eradication attempt. ^ www.t75.org. "King Arthur - Key historical facts". Indielondon.co.uk. Retrieved 2012-10-09. ^ "Woad – Definition and More". Merriam Webster. Retrieved 3 February 2011. ^ Hegi,G. Illustrierte Flora von Mitteleuropa. Spermatophyta, Band IV Teil 1. Angiospermae, Dicotyledones 2, pp. 126–131 (1986). ^ Van Der Veen, M.; Hall, A.r. ; May, J. (1993-11-01). "WOAD and the BRITONS PAINTED BLUE". Oxford Journal of Archaeology. 12 (3): 367–371. doi:10.1111/j.1468-0092.1993.tb00340.x. ISSN 1468-0092. ^ Van Der Veen, M.; Hall, A.r. ; May, J. (1993-11-01). "WOAD and the BRITONS PAINTED BLUE". Oxford Journal of Archaeology. 12 (3): 367–371. ISSN 1468-0092. doi:10.1111/j.1468-0092.1993.tb00340.x. ^ Fish, Pat, quoted in: Woad and its mis-association with Pictish BodyArt: "...(woad) is also an amazing astringent. The tattoo I did with it literally burned itself to the surface, causing me to drag the poor experimented-upon fellow to my doctor who gave me a stern chastizing for using innappropriate [sic] ink. It produced quite a bit of scar tissue, but healed very quickly, and no blue was left behind. This leads me to think it may have been used for closing battle wounds. I believe the Celts used copper for blue tattoos, they had plenty of it, and soot ash cardon for black." ^ Pyatt, F.b. ; Beaumont, E.h.; Lacy, D.; Magilton, J.r.; Buckland, P.c. (1991-03-01). "Non Isatis Sed Vitrum or, the Colour of Lindow Man". Oxford Journal of Archaeology. 10 (1): 61–73. doi:10.1111/j.1468-0092.1991.tb00006.x. ISSN 1468-0092. ^ a b Color: A Natural History of the Palette (Later Printing ed.). New York: Random House Trade Paperbacks. 2004-01-01. ISBN 9780812971422. ^ Thirsk, J . 1985: The agricultural landscape: fads and fashions. In Woodell, S.R.J. (ed. ), The English Landscape Past, Present and Future(Oxford), 129–47. ^ Fish, Pat, quoted in: Woad and its mis-association with Pictish BodyArt: "...(woad) is also an amazing astringent. The tattoo I did with it literally burned itself to the surface, causing me to drag the poor experimented-upon fellow to my doctor who gave me a stern chastizing for using innappropriate [sic] ink. It produced quite a bit of scar tissue, but healed very quickly, and no blue was left behind. This leads me to think it may have been used for closing battle wounds. I believe the Celts used copper for blue tattoos, they had plenty of it, and soot ash cardon for black. Unfortunately we need more bog bodies to prove this point!" ^ Carr, Gillian (2005-08-01). "Woad, Tattooing and Identity in Later Iron Age and Early Roman Britain". Oxford Journal of Archaeology. 24 (3): 273–292. doi:10.1111/j.1468-0092.2005.00236.x. ISSN 1468-0092. ^ Carr, Gillian (2005-08-01). "Woad, Tattooing and Identity in Later Iron Age and Early Roman Britain". Oxford Journal of Archaeology. 24 (3): 277. doi:10.1111/j.1468-0092.2005.00236.x. ISSN 1468-0092. ^ a b c Balfour-Paul, Jenny (2006). Indigo. London: Archetype Publications. ISBN 978-1-904982-15-9. ^ Michael Pauls; Dana Facaros (2007). Gascony & the pyrenees (5th ed.). London: Cadogan Guides. p. 314. ISBN 978-1-86011-360-4. ^ Werner Sombart, Der Moderne Kapitalismus (15ty ed.) 1928, vol I, p. 231. ^ Lippincott's Magazine of Popular Literature and Science, Volume 17, No. 100, April, 1876. ^ Foucaud, Édouard (1846). Frost, John, ed. The book of illustrious mechanics. p. 236. ^ Chris Cooksey. "Indigo - woad". Chriscooksey.demon.co.uk. Retrieved 2012-10-09. ^ "J B Hurry's woad bibliography". Chriscooksey.demon.co.uk. Retrieved 2012-10-09. ^ "Historic Dyes Series No. 1 - The History of Woad and the Medieval Woad Vat by John Edmonds". unknown. Retrieved 28 January 2011. ^ "Process for the development of an environmentally desirable raw material based on woad (isatis tinctoria L.)". Hans-Martin Dr. Dahse, Klausjürgen Dr. Dornberger, Albrecht Feige, Matthias Dr. Hilliger, Waldemar Prof. Künkel, Axel Prof. Stelzner. 2001-12-11. 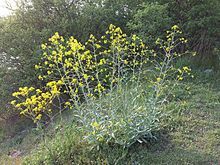 ^ "PLANTS Profile for Isatis tinctoria (Dyer's woad)". Retrieved November 11, 2014. ^ "Prohibited, Regulated and Restricted Noxious Weeds". Archived from the original on November 23, 2009. Retrieved November 24, 2009. ^ Monica L. Pokorny and Jane M. Krueger-Mangold. "Evaluating Montana's Dyer's Woad (Isatis tinctoria) Cooperative Eradication Project" (PDF). Weed Technology 2007 21:262–269. Archived from the original (PDF) on 2011-01-04. The Former Woad Industry Rex Wailes in Transactions of the Newcomen Society, 1935-36 Vol 16.